The Fiji 7s men’s team will take on Uruguay at 6.28pm in their second match in the Moscow 7s RWC while the Fijiana will face Spain in their first pool match at 6:50 this evening. Meanwhile, France-based centre Seremaia Bai kicked 12 points and tackled doggedly as Fiji beat Tonga 27-12 in their RWC opener earlier today. Fiji scored three first-half tries to lead 21-5 at halftime but Tonga pressured the home side throughout the second half. 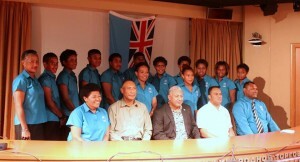 One Response to "Fiji 7s teams to face Uruguay, Spain tonight"
wananavu boys bring the cup!